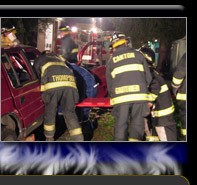 At approximately 4:20 AM on June 10th Canton Fire & Rescue was alerted to a reported two car motor vehicle accident in front of the Best Western University Inn on Route 11. Rescue 1 responded moments later and A-131 responded from Potsdam as they were returning from a medical call earlier that morning. Traffic was reduced to only one lane during the incident until Johnson's Towing could remove both vehicles. Only minor injuries were reported no one was transported to the hospital. Members were back in service around 5:30 AM. You should update your apparatus page, I didn't know you had a new ambulance!